On the new album “Field Day Rituals” the doom piano trio Splashgirl exceeds the high expectations that have been building up since the release of the group’s album “Pressure” in 2011. That album was described as “an instant classic” by Uncut Magazine and “a triumphant artistic exercise” by Jazzwise, and won a place on a number of “year’s best” lists. With its fourth album, “Field Day Rituals”, the group is taking yet another giant step up and forward. The album is detail-rich, dramatic, full of atmosphere and massive, despite the sometimes viscous and reserved quality of the music. The players themselves describe the music on the album as “lighter and more optimistic than on the previous album”, although the soundscape remains so bass-heavy that the average kitchen radio will be under threat of extinction. Here Splashgirl refines its personal idiom, although at the same time the influences of post-rock, classical music and, not least, jazz are even more apparent this time around. The album was recorded in the course of two intense weeks at Avast Studio in Seattle, USA, together with engineer and producer Randall Dunn (Akron/Family, Black Mountain, Sun City Girls, Boris, Kinski, Sunn O))) and Earth). This recording marks the first time the trio has given a producer the authority to take decisions on behalf of the band. “We found that Randall evoked qualities in the music that we ourselves had overlooked. He has an impressively broad musical perspective, and heard the music from angles that were often totally new for us. He got us to play some of the music as though it were classical jazz, which we haven’t done for a long time. Randall inspired us to take a favourable look at jazz again.” Violist Eyvind Kang (Beck, John Zorn, Marc Ribot) plays on three tracks, and Timothy Mason’s subtle modular synths are a welcome surprise in several places on the album. 2013 produced at least three truly great instrumental records – namely those by The Necks, Dawn of Midi and the Norwegian Trio Splashgirl, all operating on the jazz cusp but without the brassiness the genre usually implies. Significantly, Splashgirl´s fourth outing was produced by Randall Dunn, a man more at home with doom metal. Together they unite Splashgirl´s sombre piano and cinematic percussion with drones and bass thrums covered in pitch. But just when you´re settling in for the end of the world, tracks such as All the Vowels Missing pull the action back from the abyss, with Andreas Stensland Løwe´s piano anchoring Field Day Rituals in a very emotional place. With Field Day Rituals, Splashgirl have almost imperceptibly slipped out of their comfort zone, yet they sound totally at ease as they expand their reach. That they do so without losing track of the intense piano/bass/drum compound which is at the core of their work is testament to their maturity as an ensemble. A haunting collection of brooding and introspective soundscapes. The whole album is in fact a masterclass in creating spaces and sparsely populating them, without the sonic landscape ever getting boring. Eyvind Kang, familiar from Bill Frisell’s bands, is a guest on viola, and Timothy Mason adds some modular synth. For a band that apparently started out as a conventional jazz piano trio, it’s remarkable stuff, and strikingly original. Check it out! – The emergence of the doom jazz piano trio, anyone? That certainly seems to be what´s on the cards with Splashgirl´s fourth album on which production duites are taken up by the man behind the controls for monolithic recordings by the likes of Sunn O))), Earth and Boris – Randall Dunn(…)There is little light within the relentless gloaming shadows here, heightened by the emotively plaintive intruisions of Eyvind Kang´s viola on three tracks. On the face of it this looks like a jazz album, because it features the classic instrumental combination of piano, double bass and drums, all played by three young Norwegian friends. The reality is a lot different, as this is closer to the sound of down tempo electronica than jazz, and Splashgirl use their instruments wisely and sparingly. The album is atmospheric from the off, and quite dark at times, with the piano taking the lead. The music is mainly slow, and sometimes resembles slowly moving chant (which might explain the album title). ‘Dulcimer’ shows how the subtle electronics can be used to really good effect, while ‘Never Been Anywhere Before’ goes the other way with a pretty punchy approach. Meanwhile ‘Mass’ gets some weird spectral sounds from the bass harmonics, as well as using a viola. It’s the classic ‘less is more’ approach that works so well though, making a thoughtful and surprisingly rewarding listen, as a record to kick back to or to examine more closely. Field Day Rituals arguably has a richer, thicker sound mix than other albums, something demonstrated on stand-out track Mass. Featuring Eyvind Kang on viola and a greater focus on bowed double bass it has a disquieting, slightly anguished eeriness that also manages to project an otherworldly, Middle Eastern feel. It takes the music outside of the realm of jazz into something more mysterious and hard to place. 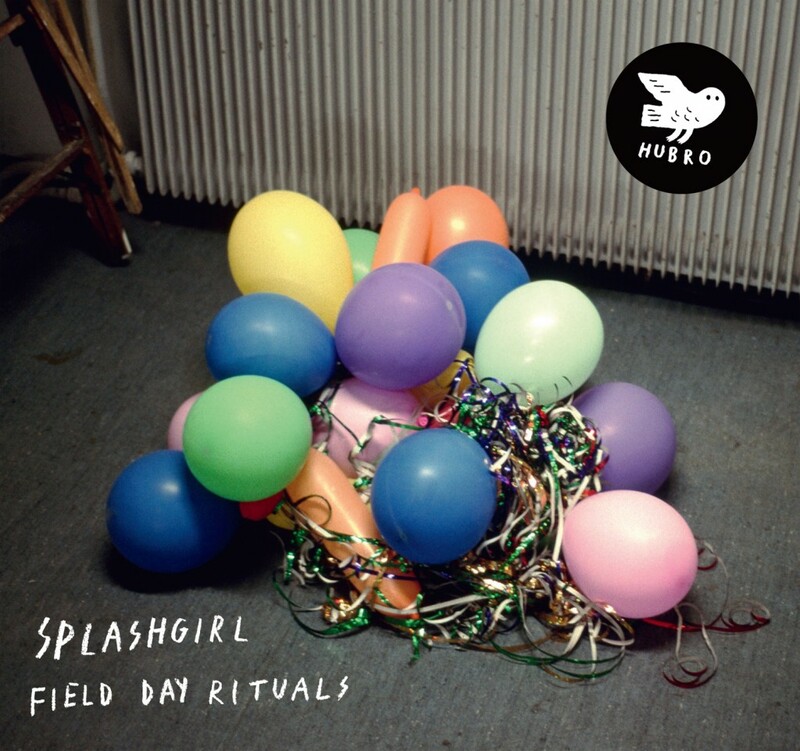 Field Day Rituals is one of those works which you know is going to move you, from the first minute. Not that it beats its chest and shouts: Splashgirl´s modus operandi is to lure into submission with subtletly. They lay out their bleak, introspective Glass/Nyman feel (they´ve been referred to as “doom-piano”) and you´re soon wrapped up in its wintry glow. & Der Club of Gore fast noch etwas zu schnell und geradeaus (wo die Mühlheimer eher mega-ironisch brechen und sprechen), scheinen Splashgirl sich aber doch sehr gut in der slowest Ecke einzurichten. Wenn sich eine Stimme erhöbe, sind Splashgirl an einigen Stellen beinahe Mark Hollis und seinen späten Talk Talk näher als dem Club of Gore. Wobei alle genannten Namen zusammen mit Splashgirl einen herrlichen Motto-Abend zu Dunkelheit und Langsamkeit gestalten könnten, muss nur noch ne Bar gefunden werden – oder ein Netzradio, denn eigentlich sollte diese Musik nicht in Gesellschaft, sondern absolut alleine gehört werden, vor dem Gerät, mit Drink(s), ohne zu wissen, ob auch nur irgendwer anderes ebenfalls zuhört. Einfach mal den Titelsong genießen, dann kommt erfreulich wenig Hoffnung oder Geselligkeit auf. Sansat eftertänksamt spel med melodisk skönhet i harmoni. I inledande Long story likaväl som många av skivans nio spår. Samspelet är musikens styrka och vad jag fascineras av, parat med de vackra kompositionerna. Mass, The portal och Never been anywhere before, i ödesmättat avskalat spel, vilket man kan spåra i fler titlar. Den senare får dock tempo och engagemang till mer lättsammare innehåll en bit in. Spännande musik som engagerar lyssnandet och tjusar öronen. Splashgirl er jazzens mørkemenn som stadig gir ut lysglimt av noen album. En i utgangspunktet konvensjonell jazztriobesetning maler langsomme lydbilder i et enormt rom som av alle ting skaper assiosiasjoner til Brian Eno, cirka «Apollo». «Field Day Rituals» vandrar dei vidare i eit slags «tungt», men også vakkert tonespråk som bandet har som varemerke. Det er framleis pianisten Andreas Stensland Løve, bassisten Jo Berger Myhre trommeslagaren Andreas Lønmo Knudsrød som på «Field Day Rituals» tek oss med inn i dette universet, der bratsjist Eyvind Kang og synth-traktør Timothy Mason er ekstra tonefølgje til det dei sjølve kallar doom-pianotrioen sin. Med det dei også kallar eit destillat av eit personleg uttrykk samstundes som påverknaden frå post-rock, klassisk musikk og ikkje minst jazz er tydelegare enn før.